kochi - Kochi Wanaba the book is OUT NOW! IT IS HERE! 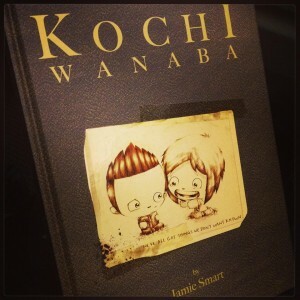 Kochi Wanaba the book is OUT NOW! IT IS HERE! I’ve been so remiss in blogging about this, and for that i apologise, but i am delighted to announce that my new book Kochi Wanaba is available to buy! Either direct from the publisher Blank Slate, your usual online retailer, or i am hearing reports of it appearing in comic stores and book shops up and down the land too. 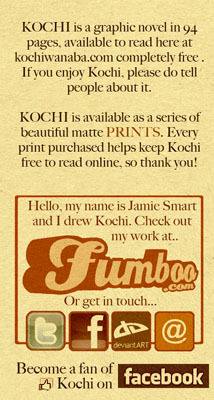 Those who have known me for a while will know Kochi is the longest of all my projects, about eight years in the making. It is a pencil-drawn graphic novel about a group of kids who hang out, being rude to each other, swearing and bitching about things. Of all the kids, quietest is Kochi, who is very introverted and prefers to spend his time with his head in a sketchbook. His unofficial girlfriend, Lhys, is quite the opposite. Loud, excitable, and willing to take all the boys on in a fight. Their group simmers with tension and resentments until one day, the Bee Festival comes to their village. What should be a happy day causes brutal fractures in the children’s friendships, and events spiral horrifically out of control. To say any more would spoil it, but its been a real labour of love, and i’m incredibly grateful to Kenny, Woodrow, and all at Blank Slate for helping this book become a reality. It’s not intended for children (swearing and violence), but it is hopefully funny, disturbing, provoking, and sweet, all at once. I really love and appreciate that people got so invested in the characters. Thank you to everyone who enjoyed it and commented! And if you have read it online, I’d urge you to check out the book too. Not only is it beautifully printed (the colours feel a lot more subtle), there’s also a small essay about Kochi and its creation, and a bundle of sketchbook pages and never before seen artwork. 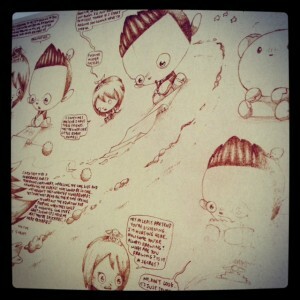 Like this, the very first sketch i did for the book. So there you go. Maybe a very last minute Christmas present, either for someone else or just for you because HEY you’ve worked HARD this year, and you DESERVE IT. Man. I am so chuffed this book exists for realsies now.